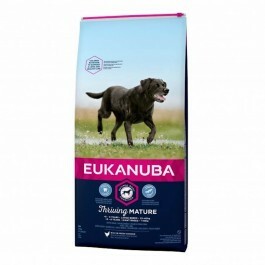 Eukanuba Mature and Senior Dog is a 100% complete and balanced nutrition for mature and senior large breed dogs >25kg and 6 years of age and over. Enriched with L-Carnitine, Eukanuba Mature & Senior Food for Large Breeds helps your dog to burn fat and maintain a healthy weight. Thanks to it's natural sources of Glucosamine and Chondroitin Sulphate, this premium dog food also helps to keep your dog's joints healthy, ensuring that they stay comfortable and active. The tailored level of protein and fat will help to keep your mature and senior dog in a healthy body condition. Optimal levels of Vitamin E and Beta-Carotene help to support the natural defences of your aging dog, so that they can continue to take on new challenges. Prebiotics and clinically proven beet pulp will help support your dog's digestive health and nutrient absorption. In addition, chicken is our primary source of protein to help build and maintain strong, lean muscles. The optimal ratio of omega-6 and -3 fatty acids in this food will ensure that your dog looks as great on the outside as they feel in the inside, with healthy skin and a radiant coat - helping to reduce shedding by up to 80%*. Our large breed food is developed with veterinarians and is recommended by top breeders. •For dogs <25kg we recommend to feed Mature & Senior Medium breed. Feeding your dog: When feeding for the first time gradually introduce Eukanuba into your dog's diet over a period of 4 days. We recommend feeding your dog twice a day. Divide the daily amount shown in the chart by the number of meals. These guideline amounts are a starting point and your 5+ / 6+ year old dog may eat more or less depending on age, temperament and activity level. Always have plenty of fresh water available for your dog to drink.